Known as the Garden Isle, it is the oldest of the major islands in the Hawaiian Island chain. It is located at the northern end of the island chain. Kauai is almost circular and its interior consists of jagged and hidden mountain terrain, most impossible to access aside from a helicopter. The coastline is more than 140 miles of white sandy beaches; it is also home to 62,000 residents. This particular part of the island is quiet and secluded. It is distinctly low-key and rural area. Brilliant blue waters, amazing green covered mountain ranges, different flowers and rich red earth accentuate this place. Lihue is the county seat of the island. In addition, it is also the business and commercial center. Schools are also located here. All of the schools are under one School District, which maintains the standard of charter schools, middle, public elementary and high schools. The Island experiences different microclimates. This is evident with its several dry areas, green valleys, and cool foothills just below high mountain rainforests. Kauai’s temperatures range from the 70’s, while during winter it goes down to the 60’s. The summer brings about 80 degrees hotness and coolness at around the 70’s. During the summer months, you’ll still feel the calm trade winds, which create a reasonably cool climate. This is very different from the heat normally experienced in other tropical areas. In all of Hawaii, Kauai has the most number of sandy beaches with nearly 45% of its coastline virtually deserted. Here, you will definitely find your perfect ‘private’ beach, where you can do various water activities like snorkeling and swimming. Moreover, you’ll also find 3 of the best golf courses in all of Hawaii. The garden island also offers a lot of natural beauty. The area has tropical woodlands, hidden coat and green mountains, perfect for hiking. In addition, there is also the amazing Na Pali Coast and amazing Waimea Canyon. These places offer easy and challenging hiking trails. Also on the Island are the bountiful and pretty coral reefs and hundreds of colorful fishes. Divers would enjoy snorkeling in the waters of the lagoons because of the captivating underwater environment. On the other hand, it is also home to a variety of rare and endangered bird and plant species, which are only found here. The Kilauea National Wildlife Refuge is reservation area for tropical seabirds. Then, there is also the National Tropical Botanical Gardens where you can find an abundant collection of botanicals found here. The real estate on the garden isle is very high in demand. The County has already placed restrictions on the amount of developments allowed in the area – both here and the island of Niihau. These development restrictions together with the number of people wanting to buy home here have created a greater demand that can’t be filled by existing buildings and housing. The greatest growth that can be seen in the area are in the Koloa-Poipu district and on the North Shore. According to Kauai’s Zoning, the building restriction only allows 4% of the island’s land to be harness and developed. Moreover, there are building restrictions in place. According to the ordinance, no building can be taller than a mature coconut palm tree. A mature palm-tree can grow up to 40 feet, which is just about four stories tall. This rule was put into place so that the towering buildings will not overshadow the tree line on the island. 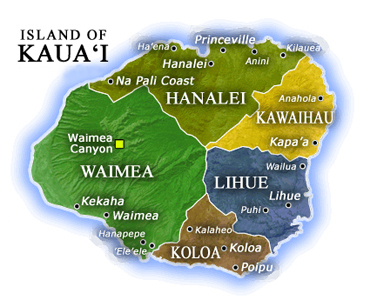 The island continues to grow and develop in the Kauai real estate market. As the developments here progress, more and more people will find it attractive to live or visit this amazing Garden Island. Listing courtesy of Terry P Kamen (Office).